Brian O’Neil joined Moore Ingram Johnson & Steele in 1985 and is a partner in the Corporate, Tax and Estate Planning department. 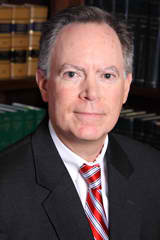 He has extensive experience in the drafting of business contracts and formation of business entities, as well as the representation of both publicly held and privately held entities, including: parties buying or selling businesses, franchisors and franchisees, representing debtors and creditors, borrowers and lenders, and parties in conjunction with the resolution of business disputes. Brian also assists businesses with corporate finance, including debt and equity financing. Born in Tampa, Florida, February 11, 1960, Brian was admitted to the State Bar of Georgia in 1985, following his graduation from the University of Georgia School of Law. In addition to his law degree, Brian earned a Master of Business Administration degree from the University of Georgia. Brian is actively involved with the Cobb Chamber of Commerce, and has participated in the Chamber’s CEO Roundtable program. Brian and his wife Mary have one daughter, Kelsey, born in 1994, and a son, Connor, born in 1998. Brian enjoys tennis and outdoor activities and closely follows University of Georgia athletics.